It’s the holiday season here in the US, but in Japan it’s just another weekend. Only it’s not just another weekend; it’s the weekend of the second of three fan festivals, this one in Tokyo and featuring exciting new information about Final Fantasy XIV’s second expansion. So while you spend the day relaxing, you can also warm yourself up with some new information about the upcoming expansion. If you don’t care about the details and just plan to buy the game no matter what, though, that works as well. You’ll be able to start pre-ordering the game on January 24th, 2017, and the expansion is planned for release on June 20th, 2017. That is currently a tentative release date, mostly because producer/director Naoki Yoshida is still apologizing for the fact that Heavensward came out in June instead of “spring” as originally planned. So get your motor running, and let’s talk about some crimson spellcasters. As basically everyone in the world speculated after the Las Vegas convention, the first new job coming to Stormblood is Red Mage. Red Mages wield a rapier and a magicked crystal medium that hovers in the air just behind the caster. It’s not a passive component, however; the Red Mage will attach the medium to the rapier to form a staff, then split the two apart once more for a variety of melee attacks. The specific role of Red Mage is ranged magical DPS, but it’s not as simple as the ranged DPS provided by Black Mages or Summoners. Red Mages will swing in and out of range for melee strikes with a variety of quick positioning abilities, and they attack using a combination of black and white magic. They also will combine spells with Chainspell and unleash them in a single burst, although the exact mechanics (and the primary stat of Red Mages) remain vague at this time. The other new job was not revealed, but it was confirmed that the expansion will feature just two new jobs rather than three. Yoshida also wore a Spider-Man shirt, which players are speculating about already; guesses include Samurai, Blue Mage, Dancer, Puppetmaster, Beastmaster, and Chemist. Red Mage will not have an associated class and appears to be starting at level 50, but it will be accessible in one of the original areas to avoid forcing players to clear through Heavensward to access the job. To players looking forward to moving through the world in a new way, Stormblood will provide that with new swimming and diving. Not all bodies of water can be entered via swimming (only select older areas, for example) and only 4.0 zones will allow for diving, but those which do allow entry will also allow full movement without fear of drowning. Water areas will not feature battle, but you can interact with gathering nodes and NPCs underwater. You can also take your flying mounts into the water, but not your ground-only mounts. And yes, you can swim in Costa Del Sol; that’s already decided. The new beast tribe was introduced, the Ananta. This tribe is an all-female tribe similar to the lamiae that players have already encountered in Allagan facilities and the like, known for their skills with gemcraft and magic. They worship the Primal Lakshmi, the Lady of Bliss, although Lakshmi may not be as much of an opponent as previous primals have been. 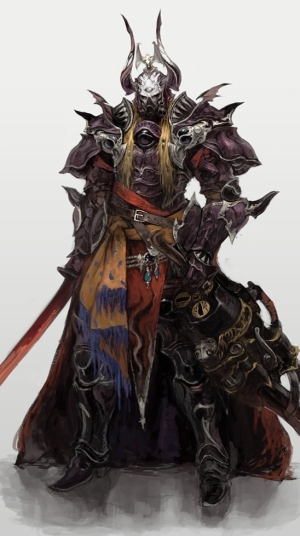 We also know that the next high-end raid akin to the Binding Coil of Bahamut and Alexander will be The Bend of Time – Omega, a nod to the recurring Omega Weapon that has also been mentioned in the game’s story since 2.3 or so. It will connect with the main scenario, although you won’t need to take part in order to see the main storyline, as always. Meanwhile, the alliance raids will also be returning, but this time they’ll be bringing in guest creators including Yasumi Matsuno (Final Fantasy Tactics, Tactics Ogre, Vagrant Story, Final Fantasy XII) and Keita Amemiya (Rudra no Hiho, Shin Megami Tensei IV, Onimusha 2). The title? Return to Ivalice. Fans of the series will recognize that Ivalice is the world of Final Fantasy Tactics and Final Fantasy XII. The obvious question is how in the world returning to Ivalice is possible with the game’s lore, but a better question is who cares, Ivalice is awesome. Last but not least, we got an early glimpse at the collector’s edition of the game. Much like Heavensward, it will feature an art book, Amano box art, and the game; it will also include a decal for one’s car and a cloth map. The digital collector’s edition (and the normal boxed collector’s edition, obviously) will include a variety of in-game goodies based off of Final Fantasy V, with a Syldra mount, a Bartz minion, and a chocobo-themed Red Mage weapon. The Final Fantasy XIV Fan Festival runs through the weekend, although we’ll obviously be a bit busy through most of the weekend. (Holidays, you know.) We’ll be sure to provide you with updates as the event rolls on, however. Next articleThe Daily Grind: Have you ever been part of a play in an MMO?